Within the small family of jewels that “play with light”, opals surely claim top honors for variety as well as sheer beauty. The opal’s fascination deepens when one realizes just how many kinds there are and how they differ. From natural to synthetic to frank imitations, the range is nothing short of amazing. Let’s look at natural opals first. All naturally occurring opals fall into one of two classes. Precious opals are the ones that produce flashes of iridescent color(s) when light strikes its surface at a various angles; this effect is called “play of color” or “colorplay”. Any opal that does not exhibit colorplay is classified as common opal. Although both precious and common opals are made of the same material, hydrous silicon dioxide (SiO2nH2O) , it is the actual arrangement of all those microscopic crystals of silica that determines whether or not the stone will diffract light into various colors of the spectrum. Common opal does not have the optimum arrangement of crystals to produce this effect, but precious opal does. 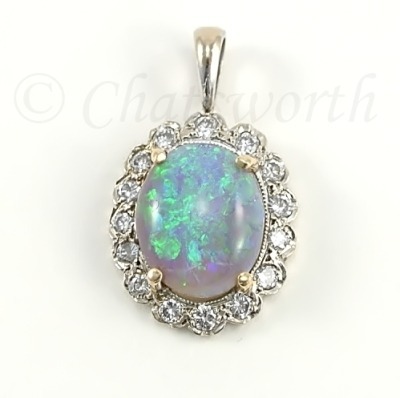 As the terms imply, precious opal occurs far more rarely in nature than does the other! White Opal, aka Light Opal: Most precious opal stones are of this type. The body color may be anywhere from milky white to bluish white to various shades of cream or even a pale yellow. Within the body color are flecks, splashes or flashes of various shades of green, blue, yellow, gold and occasionally red, in varying percentages within the light body color. Solid (not doublet or triplet) stones are translucent when held up to the light. Almost 90% of the world’s production of white opal comes from Australia, and the Coober Pedy mines in particular. 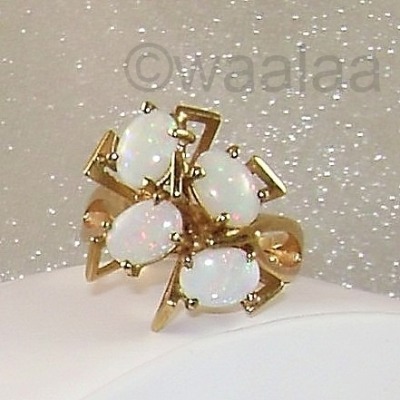 White opals are very versatile and look equally beautiful mounted in either white or yellow gold. 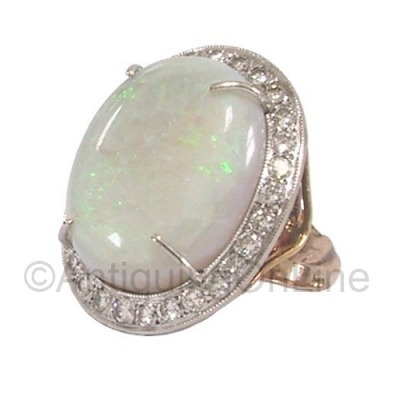 Some white opals have a single predominating colorplay rather than a mixture, as in the ring below which displays almost all green with touches of blue. Crystal Opal: When a white-opal body color is completely transparent (no opacity) and also has a play of color it is called crystal opal. Sometimes these are called water opal or jelly opal but those terms are more correctly applied to a form of common opal discussed below. The best crystal opals have a completely clear base color (the finest of these can be classified as Gem grade) but they can be any transparent color at all, including black. The defining characteristic for true crystal opal is that it has colorplay. Mexican Flash Opal: This term is applied only to stones mined in Mexico. They are crystal opals (no opacity) having a play of color and the most valued ones are either colorless or orange in base color with a contrasting colorplay. As with crystal opal mined elsewhere, the defining characteristic for Mexican Flash Opal is the presence of colorplay. Welo Opal: This new type of crystal opal was discovered in 2008 in the Welo province of Ethiopia. Unlike other opals, its base material has the unique characteristic known as “hydrophane” which as the word implies has to do with water. Stones with this characteristic will temporarily lose their color when exposed to water; as the stone gradually dries out (water evaporates) the colors usually return. 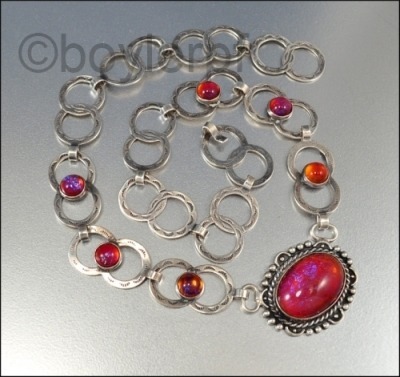 Welo opals often exhibit very bright colors in its colorplay with red being more common than blue (in Australian opals the reverse is true, with red being the most desired color because of its rarity). Black Opal: The most prized of the precious opals, black opals have a black or dark grey body color. If a solid (not doublet or triplet) true black opal stone is held up to the light, little or no light can be seen through it. The play of color within black opal may range through the entire spectrum with red being the most prized because it is the least often found. However there are many spectacular black opals that exhibit only shades of blue and green. More than 99% of the world’s black opal supply comes from Australia and the finest are and have always been mined at Lightning Ridge. The term “black opal” is often also used (even by jewelers) for light opal stones that have exceptionally deep, rich colorplay covering most of its visible surface; in other words the lighter base color can hardly be seen. However, if held up to a light source the stone will be translucent (light will glow through it). This assumes of course that the stone in question is solid (not a doublet or triplet). These “black opals” are actually light opals that have an especially dark and consistent colorplay. The stone below is one such opal, visually classified as black but it is translucent when held up to the light. 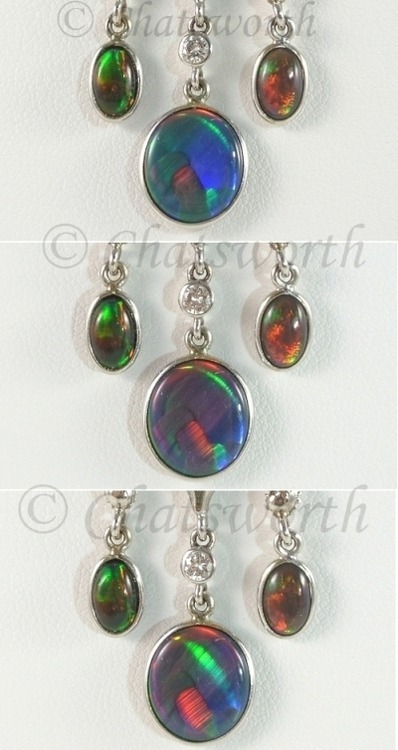 Semi-Black Opal: These opals were discovered in Australia in the 1930s. They are distinguished from true black opals by the fact that they are slightly more transparent (more light will be visible through it from behind) because their body color is a medium grey rather than dark grey or black. 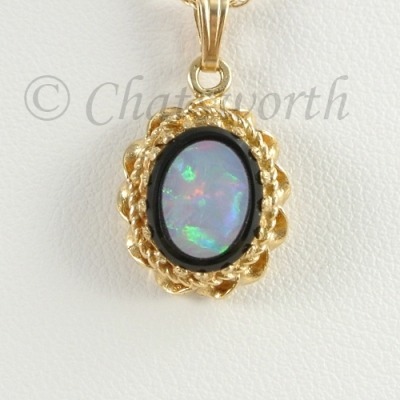 Sometimes a black crystal opal may be described as a semi-black opal if it is more translucent than transparent. Boulder Opal: Rather than being formed entirely of silica like the previous types, boulder opals consist of seams and patches of silica that have formed within a “host” or “parent” rock, often ironstone which is found especially in Queensland, Australia. Depending on the location, the host rock type can vary but the resulting finished gem is a mixture of the precious opal material plus the rock it is embedded in. Matrix Opal: Formed in the same manner as boulder opal, the difference between them is that in matrix opal there is less distinction between the opal material and the parent rock. Whereas in boulder opal the colors appear in patches and/or seams within the parent rock, in a matrix opal they appear as spots and flecks. Yowah Nuts, aka Nut Opal: Having nothing to do with nuts, these are a form of boulder/matrix opal found specifically in the Yowah region of Queensland. These “nuts” are small globular accretions of ironstone that often contain an inner kernel of solid opal, or a fine network of thin veins and branches of opal all through the ironstone. Cantera Opal: These are found only in Mexico and are formed in the same way as the Australian boulder opals except that the host rock is rhyolite (called “cantera” locally) rather than ironstone. 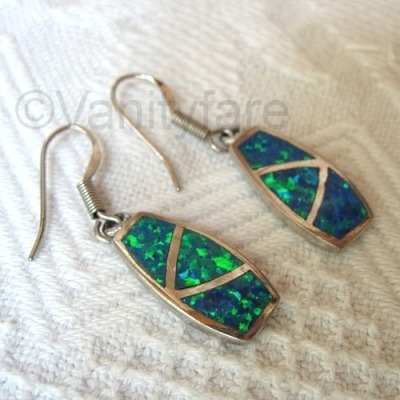 See under “Faux Opals” for an imitation version of these. Floral, aka Flower: This is the most often seen pattern, with the color patches randomly occurring like the pattern in a floral fabric or a small patchwork effect. The ring below is a good example. Pinfire, aka Pinpoint, aka Twinkle: A constellation of small pinpoint-size dots that often change in color as the stone is moved. To qualify as a pinfire pattern, the dots must cover most or all of the surface area, much like those little tiny round multicolored sugar nonpareils on top of the butter cookies at your local bakery. Straw: The color patches are longer than wide, have a somewhat striated appearance, and resemble bits of wheatstraw or hay crisscrossing each other. Ribbon: Multiple narrow, slightly curved parallel lines or thin bands of color reaching across the stone from one side to the other. A single ribbon that appears to move across the stone is called a rolling flash (see below). Palette: The sections of colorplay resemble a painter’s palette, complete with a brush-stroke effect. Chinese Writing: Found mainly in Lightning Ridge black opals, in this pattern flashes of green and gold against a black or dark grey base color look like the brush strokes of a Chinese character. Harlequin: The rarest of all opal patterns, it is only applied to stones in which the color patches form a checkerboard of squares or rectangles of alternating colors. Flagstone: Second only to harlequin in rarity, in this pattern the patches are a mix of diamond shapes and rectangles (like a flagstone pathway). Contra Luz: Literally, “against light”; this is a pattern effect seen only in some crystal opals and means that the colorplay is visible when the stone has the light source behind it rather than in front. Normally the colorplay in a stone will disappear in this orientation but if it does not, then the crystal opal has a contra luz pattern. Face-up Color, aka Face-up Fire: This is a very desirable quality in an opal because it differs from how the stones often react. Normally an opal’s colorplay only shows to best advantage when light strikes it from the front diagonal (i.e., with the light coming over your left or right shoulder as you hold it up). 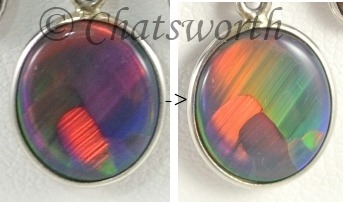 Opals with “face-up color”, however, also can show a strong colorplay when viewed from directly above. Clearly this is a huge advantage for jewelry pieces and displays, and such stones may command a higher price because of this quality. Rolling Flash, aka Mobile Flash, aka Directional Flash: Stones with this characteristic display flashes of color when viewed from different angles or when the light source moves. In a directional flash, the intensity of a given color increases or decreases within its own area according to the angle of light; in a rolling flash, a single color effect travels intact across the face of the stone regardless of what colors are beneath it; a mobile flash is one in which the flash effect transitions from one color into another as the light source shifts. The most desirable is a “rolling red flash”. The largest of this color-matched trio of beautiful Lightning Ridge black opals demonstrates the progression of a rolling green flash as well as a directional red flash, against a base colorplay of ultramarine blue and forest green. As the light source moves and the green flash completes its journey, the base colorplay shifts into and through the reds and violet purples before transforming the same areas that began as dark green and blue into orange and green. It is not unusual to have a ‘dead flash’ area at certain angles in opals that exhibit multiple moving-flash effects. Before leaving the subject of precious opal, a quick definition is in order. A ‘solid‘ opal is one in which there is nothing else but the natural stone. A ‘doublet‘ is an opal (or a slice of an opal) that has been affixed to a thin layer of black or dark material – either a piece of opal matrix, black onyx, or obsidian – in order to enhance whatever color is in the white or light opal, in the same way as a moonstone’s color is brought out against a black surface. The pendant below is obviously a doublet; but when such a stone is mounted in a setting that does not allow it to be inspected from the side, misunderstandings can occur. 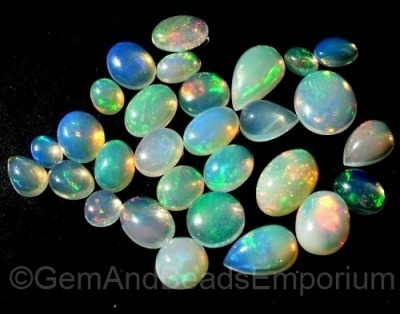 If a white or light opal doublet is held up to the light it will “behave” like a black opal (allow little or no light to shine through) because of this dark backing material. A ‘triplet‘ is a doublet with the addition of a clear quartz “cap” on the top. These are often slightly curved so that the appearance of the opal beneath is magnified. As with a doublet, this is done to enhance the visual appearance of a light colored opal, and/or to make a slice of opal material appear to be a solid stone. Any opal that does not exhibit a play of color in response to light is classified as “common opal”. Unfortunately one type of common opal is often confused with precious opal and with an imitation opal….so we’ll start with that! Fire Opal: The description “fire opal” is only correct when applied to a transparent-to-translucent opal that does NOT have a play of color. This term refers not to an iridescent colorplay (which in precious opal is indeed often called “fire”) but instead to the body color of the opal which ranges from deep yellow through all the shades of fire and flame to orange and orange-red. Some stones may be translucent enough to have a perceptible opalescent sheen but this is not considered to be “fire” in the sense of being colorplay. Most fire opals are mined in Mexico. Water seeps into lava flows which are rich in silica and eventually as a result of heat and pressure this combination transforms into fire opal ‘pebbles’. Fire opal is unique among opals in that fine specimens can be faceted into sparkling jewels. 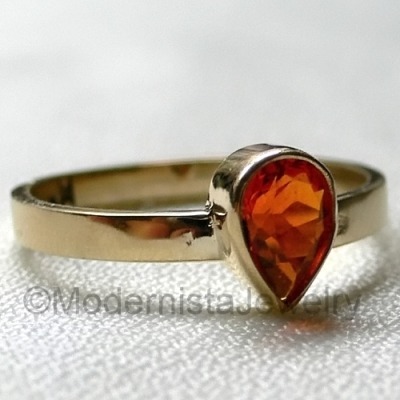 The rings below show two of the warm shades and interesting cuts that can be found in high-quality Mexican fire opal. Water Opal, aka Hyalite Opal, aka Mullers Glass, aka Jelly Opal: Remember the mention of crystal opal waaay back there in the precious opal section? Any clear colorless transparent opal that does NOT show a play of color is known as water opal (calling it “crystal opal” is incorrect, despite its appearance). This type of opal is based on hyalite rather than silica, and has the unique property of flourescing green under blacklight – something that no other type of opal will do. Sometimes this stone will display a very faint tint or iridescence of color that could be misinterpreted as colorplay, but a quick check under blacklight will remove any doubt. There is also a Swarovski crystal color called “water opal” which, being a clear rhinestone, only adds to the general confusion about what water opal is. Again, a blacklight is your best friend, as illustrated below! Potch Opal: These stones can appear in varying shades of milky white, any shade of grey from very pale to very dark, a blue-grey, or black; sometimes as a solid color and sometimes in a mixture. Stones exhibiting only white and black together are called “magpie potch”. These are often made into beads. Pink Opal: This is another color often made into beads and cabochons for jewelry; much of it comes from Peru and Mexico. The colors can range from white with the barest hint of pink, through all possible shades of pink and rose, even into tints of mauve, lavender and lilac. Blue Opal: Many blue opals are a very attractive shade of robins-egg or Wedgwood blue; another favorite for beads as well as jewelry cabochons. Morado Opal: The Spanish word for purple is “morado”, and some of the common opal mined in Mexico is given this name if the body color happens to be in the violet or purple range. Treated Opals: It should be mentioned that some natural opals (both precious and common) may be treated in order to improve their appearance colorwise or to correct a flaw. The color of a light opal can be darkened by the injection of a dye. An opal with inclusions or the potential to crack in the future may be impregnated with an oil, plastic, resin or wax to help stabilize it. Light stones might be backed with a layer of dark lacquer in order to avoid the telltale ‘bonding line’ that is visible in a doublet under magnification. A truly “natural” opal is a stone that has not been altered from its natural out-of-the-ground state by anything other than cutting and polishing. 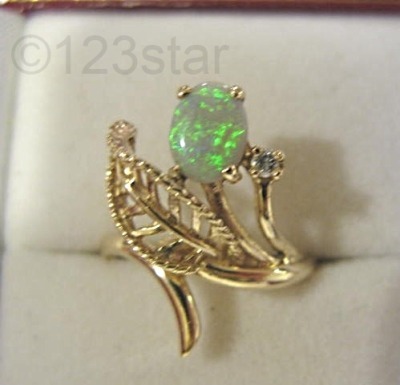 There is a difference between “synthetic” opal and “imitation” or “faux” opal. Synthetic opals are made in a laboratory from the same chemical (silicon dioxide) that occurs in natural opals. The process was developed in the 1930s and thus synthetic opals have been around for about eighty years! Some of them look very much like natural precious opal but there are several ways to tell them apart: (1) The colors in synthetic opal are usually brighter and occur in larger patches, often with a sort of ‘snakeskin’ pattern (2) Under magnification the color patterns will appear more regularly geometric than those in a natural opal and (3) The overall pattern appears more ‘neat and orderly’ than those in the naturally formed stones. 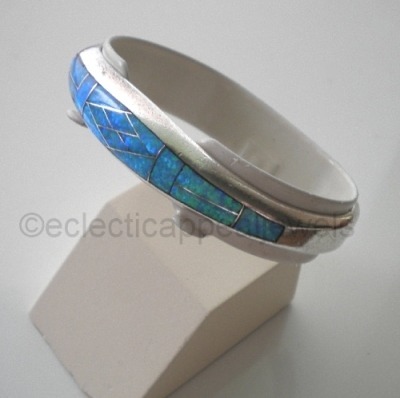 This sterling silver bracelet is inlaid with lab created opal. Both natural and synthetic opals are used in opal-inlay jewelry. 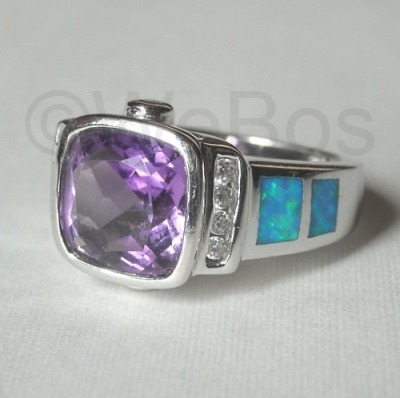 The amethyst ring below shows two squares of blue-green opal inlay on each side. In these earrings, instead of one relatively large thin slice of opal, many small chips and slices are embedded together to form sections that are densely packed with color. This category includes every “opal-appearing” stone that is not made of (or from) silicon dioxide, hydrophane (Welo opal) or hyalite (water opal) ….. which pretty much leaves us with the faux opals made of either glass, acrylic plastic, or resin. Dragon’s Breath, aka Jelly Opal: This is a unique form of art glass stone developed in the early 20th century. During the production process certain metals are added to the molten glass; they produce a base color in various shades of red, orange, and rose with streaks and patches of blues and purples suspended within. The intensity of these ‘breaths’ of contrasting colors changes with the angle of the light, similar to the colorplay response of precious opal. The typical shape for these glass stones is a round or oval cabochon so that the curved top can maximize the interesting color changes within. Confusion often results from its other common name of “jelly opal” which is sometimes also used to (incorrectly) refer to the natural water opal/hyalite and sometimes (even more incorrectly) to crystal opal. In my opinion it would be a good thing if the term “jelly opal” was retired forever! Other names occasionally applied to Dragon’s Breath glass stones are Mexican glass opal, Glass jelly opal, and Glass fire opal. 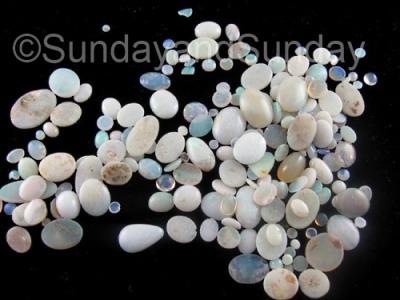 Faux Cantera Opals: As mentioned previously, cantera opals are mined in Mexico and are similar to the Australian boulder opals in formation and appearance. In recent years an imitation cantera opal was developed in which a textured and colored resin mimics the appearance of the natural rhyolite stone matrix. Thin sections or slivers of either natural or synthetic opal are inlaid into this faux stone base. If these stones are mounted into jewelry it is not easy to distinguish them from the natural stones because the resin/rock weight difference is obscured. Glass and Acrylic Plastic Opals: These are the most numerous of the precious-opal lookalikes, and the glass stones were and are the most common. Pieces of colored foil are embedded within the molded glass cabochon during manufacture. The great majority of faux opal glass stones are in shades of pink, lavender, purple and gold with touches of blue. This circa-1970s brooch-pendant by Sarah Coventry is a very typical example. 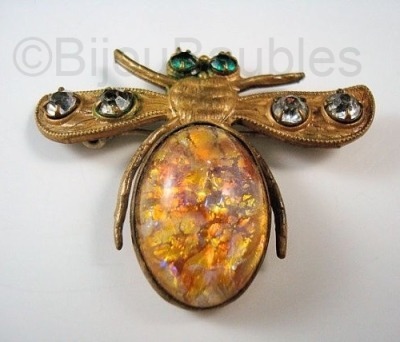 Glass faux opals were already being made at the turn of the century using the internal-foil technique, as seen in the unusual gold-and-honey foil glass stone appropriately forming the body of a bee brooch with paste rhinestones decorating its wings. Although acrylic (lucite) plastic was often made in a “confetti” style for jewelry, and in its clear formulation does a fantastic job of imitating glass, the bits of foil are usually too regular and too widely spaced to give the same faux-opal effect as the foil glass stones. Glass stones also offer the advantage (over acrylic) of being very scratch-resistant, although chips are always a possibility of course. The history, folklore and myths surrounding the opal have been exhaustively covered in numerous other venues and so I won’t go into those. However, one misconception still exists about opal care and that is the oft-repeated advice to soak them in either water or oil in order to prevent “cracks” or “shrinkage and loosening in its setting.” Neither advice has any basis in fact. The only opal stone that will be at all affected by contact with water is hydrophane opal (see Welo opal above) and there is a 50/50 chance of harming the stone rather than helping it by so doing. If an opal develops a crack, it is because of an internal flaw and no soaking (or lack thereof) would have avoided it. 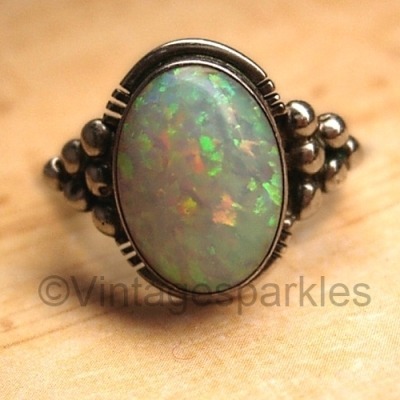 And lastly, don’t believe that old superstition that opals are bad luck! The Victorians loved them and considered them a good-luck stone no matter what month the wearer was born in (opal is birthstone for October) and even today in Japan an opal is considered a traditional good-fortune gift for a wedding. Opals – natural, synthetic, or faux – are for everyone! Cats and Tigers and Stars, Oh My! 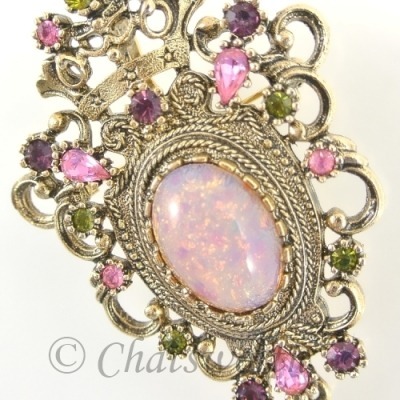 Hey first off all the Opal jewelry designs are amazing and thanks for giving in depth information about this gemstone. 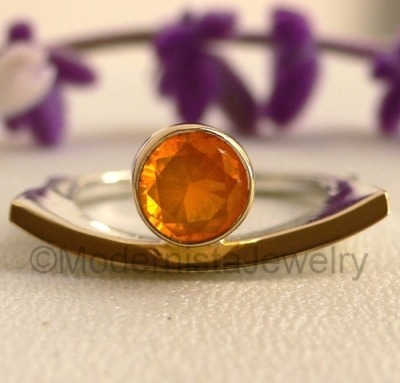 I love this gemstone, it is also my birthstone.